We love the Moleskine notebook for its durability and versatility. Now the makers of the popular durable notebook have a new online tool that can print custom pages to fit perfectly into your Moleskine. The MSK wizard (as it's called) can create custom pages with any image or text you want, build an attractive calendar, or make your address book Moleskine-friendly. 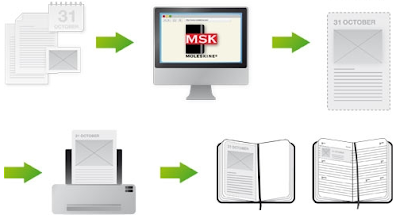 MSK produces a PDF for whichever page type you're creating that—in theory—you can easily print out onto your Moleskine pages (or maybe onto a page you'd cut out and past into your Moleskine). It's a cool service for the serious Moleskine junkie. Also, take some time to go through really cool artwork submitted by Moleskine users. If you guys want some moleskin icons for your desktop, Joe Mansfield created some free Moleskine icons using Google Sketchup to bring that love to his desktop. Download them now.